In a campaign rally in Phoenix on Tuesday night, Donald Trump repeatedly defended his response to the deadly white supremacist rally in Charlottesville as thousands of protesters who had gathered outside were attacked by police with tear gas and pepper balls. During his speech, Trump blasted the corporate media and also threatened a government shutdown if he didn’t get Congressional approval to build a wall along the southern border. Ahead of Trump’s speech in Phoenix on Tuesday, there was much speculation that Trump would pardon Arizona sheriff Joe Arpaio, who was convicted of contempt of court for defying an order to stop his deputies from detaining people on suspicion of being undocumented. While he didn’t pardon Arpaio on Tuesday, Trump hinted during his speech that a pardon would be coming soon. Earlier this week, Amy Goodman interviewed award-winning actor Alec Baldwin, the acclaimed Donald Trump impersonator on Saturday Night Live. Baldwin’s performances have been seen by millions—including President Trump himself. 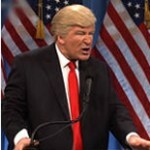 Baldwin is currently preparing for another run of Trump impersonations on the upcoming season of Saturday Night Live. Debate: As Trump Prolongs War in Afghanistan, Should U.S. Pull Out Troops Immediately? In a prime-time address on Monday, Trump vowed to step up the U.S. military campaign in Afghanistan which began nearly 16 years ago, extending the longest war in U.S. history. Earlier this month, The New York Times reported that Trump may have found a reason to prolong the nearly 16-year war: Afghanistan’s untapped mineral deposits, which could be worth nearly a trillion dollars.